Two-time RITA® Finalist and winner of the coveted HOLT Medallion and ACFW Carol Award, CBA bestselling author, Karen Witemeyer, joins us today! She has quickly become one of my favorite authors and I’m thrilled to host her for a second time. I loved her book Short-Straw Bride and am consumed with book two in the series, Stealing the Preacher. Karen writes historical romance fiction for Bethany House, believing that the world needs more happily-ever-afters. She is an avid cross-stitcher, shower singer, and bakes a mean apple cobbler. She grew up in a small town in central California, attended Abilene Christian University, where she met a Texan, married him, and never left. They have been married for 20 years and live in Abilene with their three children. They both work at the university where they met. 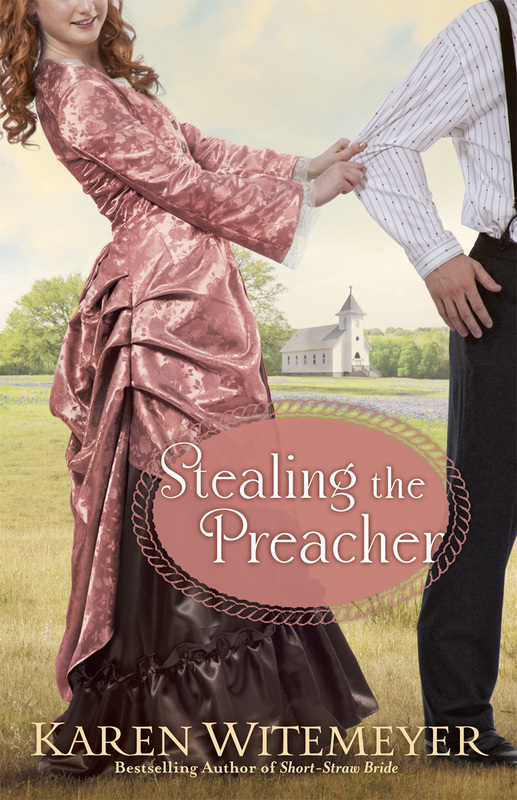 Karen is offering one copy of Stealing the Preacher to one winner. Please leave a comment for her along with your email address for a chance to win. We must have at least ten comments to make a contest, so make sure and share this post with your friends. Continental US only, please. If you missed Karen’s first interview with me, please take time to read it. This interview, we’ll get to know her a little bit better. Karen, thank you for joining me again here on my blog. Tell us a little about your faith and how it affects your writing. I grew up in a Christian home and came to know Jesus at an early age. Therefore, my faith is an essential part of who I am, and when I decided to try my hand at writing novels, it was important to me that my stories honored God. I pray over my writing every day and try to infuse subtle nuggets of truth within the pages of an entertaining read. Writing is a ministry. It’s a business, too, but first and foremost, it’s about encouraging readers to deepen their relationship with the Lord. Thank you for sharing that! I think it’s important for readers to know your heart and it’s also an encouragement to writers, as well. Do you have a favorite scripture? If so, why is it your favorite? I have two favorite verses related to my writing that I keep near my desk. The first is Philippians 1:6 – He who began a good work in you will carry it on to completion until the day of Christ Jesus. This verse reminds me to keep plugging away even when the story doesn’t want to come. God will help me see it through to completion. The second verse I keep out as a humility reminder. Psalm 115:1 – Not to us, O Lord, not to us, but to your name give glory. I need this reminder to keep my perspective straight. Any success I experience is due to God’s influence, and he deserves the glory, not me. I love those verses! Discouragement is everywhere these days and the scriptures sure help keep me pressing on to the goal! Okay, so, I am reading your latest book, Stealing the Preacher, and loving it (as I said before). The Archer brothers are captivating! Tell our readers about it. On his way to interview for a position at a church in the Piney Woods of Texas, Crockett Archer can’t believe it when he’s forced off the train by an outlaw and presented to the man’s daughter as the preacher she requested for her birthday. He’s determined to escape—which would be much easier if he could stop thinking about Joanna Robbins and her unexpected request. After the amazing response to the Archer brothers depicted in Short-Straw Bride, I couldn’t wait to craft a story for Crockett, the charmer of the Archer clan. Since Crockett is no ordinary preacher, but a gun-toting rancher with a gift for doctoring . . . well, that meant a plot full of scrapes, trouble, and shenanigans. But amid the adventure and romance lies a heartrending tale of God’s pursuit of a single lost soul. I won’t give anything away about the story, but I have to say how much I like how you took Crockett’s plans and replaced them with God’s plans. And how he willingly let those plans change. It spoke volumes to me. What are you working on right now? My next project is actually a novella that features Neill Archer, the final brother in the Archer clan. I just couldn’t let him go without giving him his own happily ever after. Away from the Archer ranch for two years to earn the money needed to start up his own spread with his childhood friend, Josiah, Neill takes a job repairing a little old widow’s roof. Only the widow isn’t old nor is she little. She’s nine months pregnant with her deceased husband’s child, and she meets Neill with a shotgun aimed at his chest. Neill’s story, A Cowboy Unmatched, will be part of a collection entitled A Match Made in Texas. It releases January 2014 and includes novellas by three other wonderful historical authors: Mary Connealy, Regina Jennings, and Carol Cox. I can’t wait to read Neill’s story! What is your writing schedule and where do you write? I have three children still at home and I work full-time as the Testing Coordinator for Abilene Christian University. Because of this, my writing schedule has to be very flexible. Instead of daily word count goals, I have a weekly goal of one polished chapter a week. This allows me the flexibility to make up for lost time over a weekend if my week was too full without feeling guilty. At this rate, I can meet my deadlines and keep my sanity—two objectives I find essential to success. How do you balance writing with your job, family responsibilities, and other obligations? I have definitely learned how to juggle. Thankfully, God takes care of me and provides the time I need. Whether I write at work over lunch hours or during down time, or sit on my bed with my lap top during evenings and weekends, somehow the words make it to the page. I pray a lot, set boundaries, and occasionally use my husband to run interference. In the end, it all works out. My kids are grown, I work two part time jobs from home, and I’m in Women’s Ministry at my church. I find writing a challenge at times. My hat is off to you, Karen! For fun: If you could travel to anywhere in the world, where would you go and why? If money was no object, I would love to tour the castles of Germany. I love mountain settings, romance, and fairy tales. What could be more romantic than the castle that inspired the home of Disney’s Sleeping Beauty situated in the Bavarian mountains? I get dreamy-eyed just looking at pictures of Neuschwanstein. I’d also like to see elegant Eltz Castle and historic Wartburg Castle. Wartburg is one of the oldest preserved castles as well as a place where church reformer Martin Luther lived and translated the Bible into German. How awesome would that be to see? My daughter would love touring the castles and my husband would dutifully ooh and aah, but I might have to bribe my boys with a ski trip or something to get them to tour the castles with me. Such fun! Now one more question about your spiritual walk. What is your number one spiritual gift? I’m not sure, but I think teaching is probably near the top of the list. Whether it comes in the form of story in my books, or teaching ladies Bible class, or instructing on writing, or even just helping my kids with their homework – teaching is something that I feel comfortable doing and gives me great satisfaction. Thank you for sharing with us again! Where can readers find out more about you and your books? I also love to interact with readers through Facebook and the two group blogs I contribute to. If you like my page, you can gain access to the first three chapters of Stealing the Preacher for free. Thanks for stopping by today, June! Thanks, Pegg! So glad you enjoyed Crockett’s story. Karen, I so enjoyed Short Straw Bride and I’m glad that Neill will get his own story too. A very special thank you for sharing Phil. 1:6 – I needed to be reminded of that verse today for reasons unrelated to writing. Blessings! Thanks for the kind comments. Isn’t it wonderful how God can speak just what we need to hear in the most ordinary of places? I love that! This book is on my must-read list! I love your stories! I enjoyed your book Short Straw Bride a lot and I know I’ll be looking forward to reading Stealing the Preacher. Thanks, Jennifer. I just grew too attached to those Archer men. I couldn’t resist the chance to give them all a happily ever after. I so enjoyed the interview–both the questions and the answers. Thank you Sherri and Karen. I’m sure I would enjoy reading all of Karen’s books. Thank you for offering an opportunity to win one. So glad you enjoyed it Kay. You’re entered in the drawing for sure. I am so excited to read Crockett’s story! Thanks for doing a giveaway and for the great interview! Thanks, Heidi. I sure had a lot of fun with this one! I’m so excited to read Crockett’s story! Thanks for doing a giveaway and the great interview! Thanks for stopping by today. You’re in the drawing! Thank you for this fabulous interview with Karen. I love Her writing. Such fun reads! Karen is one of my new favorite authors – have all her books but this one! Cynthia – You are one of my new favorite readers. 🙂 Hope you enjoy Crockett’s tale! Thanks, Amanda! I hope you get a chance to read Crockett and Joanna’s story soon. These Archer brothers sure were fun for me! I’d love to give you an excuse to give my books a try, Annette. Thanks for entering! Have started Short Straw Bride and love it. Would be great to win so I could continue the series. I really enjoyed Short Straw Bride (granted, I must say the same for each of the novels) and really look forward to the sequel! And I’m glad to hear there will be a novella featuring Neill – one grows rather attached to the characters after investing 300+ pages of one’s time, so it’s always nice to hear their stories too! Love the title, Karen. And the cover is an attention getter! God continue to bless your writing. I love the covers for your books, they are so colorful. Short Straw Bride was great! This is an awesome book, for sure!!! And Short Straw Bride will probably be on my number one list for years to come!